Heat oven to 350°F. Line cookie sheet with cooking parchment paper or spray with cooking spray. In small bowl, stir granulated sugar and cinnamon; set aside. On lightly floured surface, roll out dough into 9x6-inch rectangle. 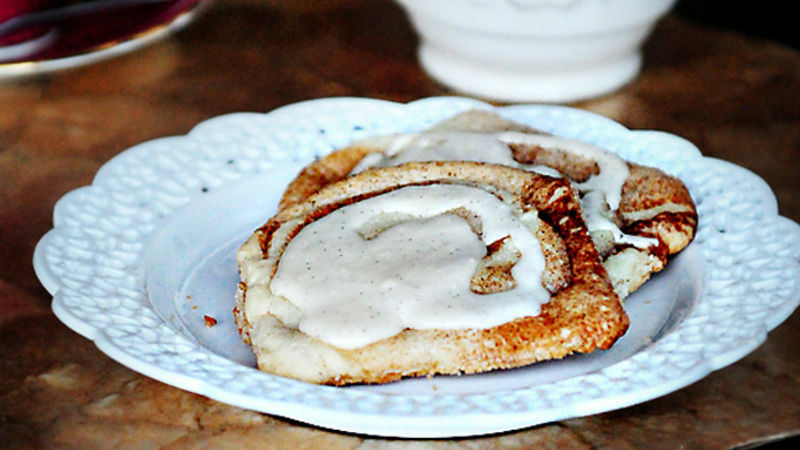 Spread cinnamon-sugar over dough; gently press into dough. Carefully roll up dough, starting at short side, into log; sprinkle with any cinnamon-sugar that falls out. Cut dough into 12 (1/2-inch) slices, using sharp knife; place slices 2 inches apart on cookie sheet. Bake 15 to 18 minutes or until edges are light golden brown. Cool 2 minutes; remove from cookie sheet to cooling rack. Cool completely before glazing. In small bowl, beat all glaze ingredients, except warm water, with spoon until smooth. If necessary, add warm water, 1 tablespoon at a time, until desired consistency. Drizzle glaze over cooled cookies; let stand until set. Store in airtight container, using waxed paper between cookie layers. When rolling up cookie dough, if there are cracks or breaks don’t panic. Simply press the dough back together with your fingers. For best results, take cookies out of the oven before they look too brown. They will continue to firm up as they cool on the cookie sheet.